IF YOUR AIM IS TO DEVELOP a Lowcountry community that captures the essence of historic Charleston, you should find a local builder with years of valuable experience along the Carolina coast. That-s exactly the case in Branch Creek, a classic development now rising from wooded lots near Highway 78 in Summerville. Meridian Builders, which has put its imprint on more than 14 Lowcountry communities in the past four years, is building what eventually will be a quaint neighborhood of 116 Charleston-style homes. "Charleston-style homes are not that common in today-s market," according to Travis McCutchen, sales manager with Prudential Carolina Real Estate-s New Homes Division. "These are homes with character." And tradition as well. As on the Charleston peninsula, homes in Branch Creek will feature detached garages and split driveways with grass in the middle, "to keep it as green as possible," McCutchen says. All homes will have front porches with round and square columns. "These will be true Charleston-single homes," he comments. McCutchen points out that lush landscaping will be a key aspect of Branch Creek-s appeal and that each property will be adorned with live oaks, a Lowcountry staple. He says most homes will back up to wetlands, woods or ponds. Care will be taken to provide the best in Lowcountry living inside as well as out. Meridian-s Cottage Series homes will feature 9-foot smooth ceilings, solid-surface counter tops, hardwood floors and 42-inch cabinets in the kitchen and tankless hot-water heaters. 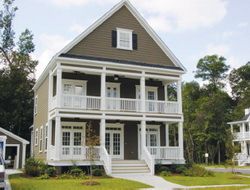 All windows will be cased out in a traditional Charleston molding package, and six-panel doors will be standard, as will Hardiplank siding. Homes in Branch Creek, ranging from 1,800 square feet to 2,700 square feet, are selling for $319,000 to the low $400s. In late May 2007, eight homes were ready for residency, and construction on the entire neighborhood was expected to be completed some time in 2009, according to McCutchen. He points out that location is an important drawing card for Branch Creek-in the small town of Summerville but still close to Charleston and South Carolina-s best beaches. He adds that the neighborhood-s developers will not sacrifice its character by reproducing as many cookie-cutter houses as possible. 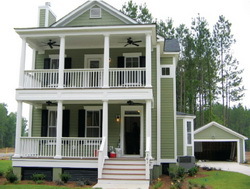 "You-ll be buying from a local builder who is in touch with the Lowcountry," McCutchen says. "Meridian knows what the look is and they have a very defined street-scape they produce. You won-t see concrete and garages when you drive through the neighborhood. You-ll see homes."